This post is going to be an introduction to technical analysis on Bitcoin for anyone trying to understand the basics. The techniques are the same as you would apply to any chart whether its Forex or cryptocurrency so if you have already been trading for a while you may already understand these techniques. I will follow up on this one with a some more advanced technical analysis techniques at a later date and I will post it here when it is ready. For people completely new lets start with a Candle. A candle or candlestick represents the movement in the market for a particular length of time eg 1min, 15min, 1 day or even longer. In the screenshot below you will see 3 main parts highlighted. Upper Wick – The top of the wick shows the high that the price reached during that candle. 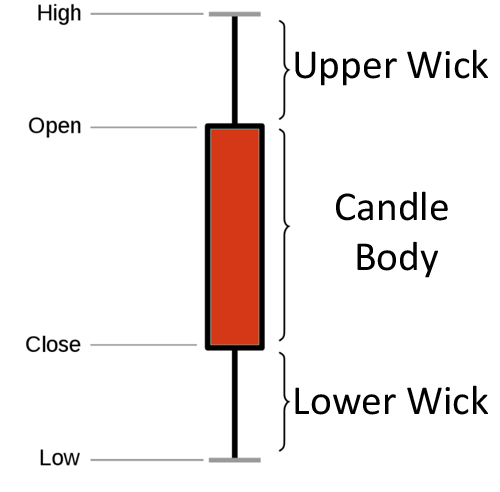 The Body – This shows the open and close of the candle. If it closes below the open then the market has gone down or if it closes above the open then the market has gone up. Lower Wick – This shows the lowest price the market has reached in this time-frame. There are other candle types like renko bars that are based on movement rather than time but the majority of people look at time based candlesticks. 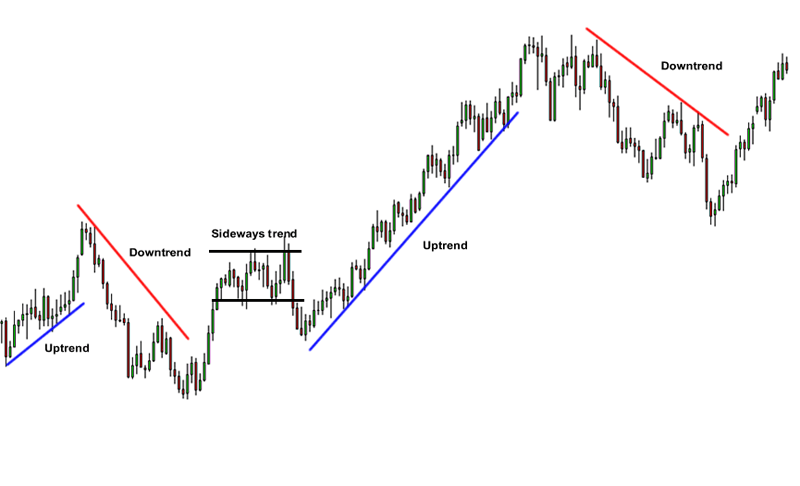 Trend-lines are one of the most common techniques you will hear about when you hear of people talking about technical analysis. It is basically a technique to identify the direction the market is moving and points at which it could potentially change. To draw a trendline you just need to locate 2 major tops or bottoms, Draw a diagonal line between them and continue to out at the same angle. Sounds very simple and technically it can be but alot of people do it wrong and draw the lines to try and prove their own expectation on where the market is going. With trend lines you can prove most theories you have if you really want to which you can see in my video at the start of this post so when you are drawing your lines try to be objective. You can also have multiple trendlines on your charts like short term trends which are movements on smaller timeframes and then longer term trend lines as well. Support and resistance is where you find points in the market that the price has failed to cross and reversed its direction. Support will be found underneath the current price and it is the lowest price the market hit in a set time-frame hence it supports the price and keeps it up. Resistance refers to the level above the current price where the market has struggled to break so it is the highest point the market has reached. There is no exact way of plotting your lines and different people will do it different ways. The most common way is finding a level that the market has failed to cross 2 or more times and then draw a horizontal line at that point. As you draw the lines you will see looking back through time that them levels have probably been respected a good few times meaning the market did not cross them multiple times, if you see this it means it is a strong point. 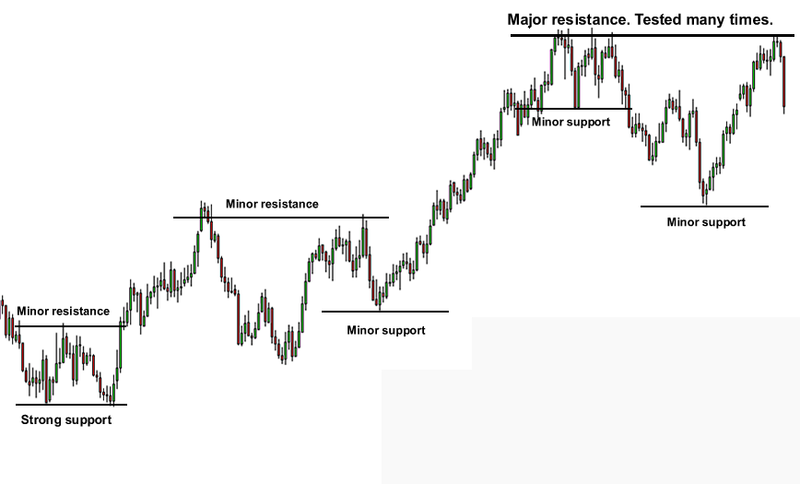 You can have major and minor support / resistance levels on your chart. Major ones are identified as points where you have seen the price reverse at multiple times or levels that have not been breached in a while. Minor are points where the market has reversed its direction but might not necessarily be replicated at that point i the history of the chart you are looking at. TradingView and Coinigy are two of the most popular and easy to use charting software’s. So in the post above and the video I have given the very basics of technical analysis as we see more and more people talking about it. I found that people who came from a Forex background had a good grip on it but others whose first venture into trading was through bitcoin and cryptocurrencies were missing some of the basic understandings. Now you can go alot more complicated on this but I stuck to the very basics here. The next steps to look at are types of candlesticks and indicators like moving averages and fibonacci. I will probably do another video and post on them at another time as well so make sure you subscribe to my YouTube if you found this useful. On a final note don’t forget about fundamental analysis as well as news and regulations also play a big role in how the Cryptocurrency markets move. If you found this post useful feel free to SHARE it to help spread some knowledge.